Yesterday Gillian and Suzanne were selected to talk with a group of teachers from across Wellington about the work they have been leading in the area of 'Incredible Years Teaching' or IYT for short. It's great for these two to be recognised like this. using appropriate consequences for undesirable behaviour. An area of professional learning for our teachers this year has been around academic and social/emotional coaching with children. The word coaching itself is interesting. The term originated in a town called Kocs in Hungary, where the 'coach' was invented. It "carried people over rough terrain". Well, children, all of us, need to learn the skills to carry ourselves........ eventually. Teachers/parents/managers........... aren't carriers but we can provide direction, nourishment and the environment for growth. Combining coaching with our emphasis on wellbeing/positive education, our 3 key principles and the national focus to make the move from punitive to restorative practice, we are reviewing our current 'behaviour management' practices. What rule has been broken? Who is to blame? What is the punishment going to be? What happened? Who has been affected? How? What needs to be done to put things right? Are our consequences supporting social and emotional growth? What part do children's strengths play? Where are we at with our own understanding of restorative practice? It's a work in progress...... watch this space. Any thoughts for consideration, please chat with Suzanne or Gillian. It's a really interesting area of learning and there are always many perspectives. We have 3 weeks of Term 3 to go, and talk about packed and requiring your help! Celebrations of Learning - SLCs + Treasure Hunt. 30% of our children do not have a booking, these close next week. Eek - help! PFP brings Sew Love: Next week - please see separate item. 22 September - Year 3/4 Sleepover here at school - requires parent volunteers too. Please help! 22 September is also World Character Day. If you can make a coffee at 9.00am in the staffroom, I would love to chat with you about what the focus on character strengths is all about. I will also pop the main points in a newsletter, as I realise not everyone will be able to make it. The Treasure Island Fair of the Year - 13 November. Some Fair Stalls are filling up fast, some are already full, other lovely parent volunteers are looking a bit lonely. Please get onto popping your name down ASAP. This is the main fundraising/ community event that everyone get's involved in. Help out, it's fun! Here's to a great weekend. Evie, Yoichi, Sitara, Griffin, Leola, Luc and Zoe. Hayley, Luca, Cody, Alba, Anatole and Alexander. Please book a time with the area where you child is (Autahi, Tautoru or Mahutonga/Matariki). Bookings will close at midday on Wednesday 7 September. If you are totally confused, please chat to a teacher in your area or Steph in the office and they will get you on track. The Year 3 and 4 Sleepover is on Thursday 22nd September 2016. 6.00pm - The children eat an early dinner at home then arrive with parents to help them sort their beds out. Then until 7.00pm - Game on bottom court, followed by hot drinks and pikelets. Teachers and parents staying over will organise a few activities to help with the wind down before bed! 7.00 - 7.15am - Parents collect their children and their belongings. After breakfast at home the children may return to school between the usual start time and 10.00am or may stay at home and start their holiday early. Please read the Letter from Public Health Nurse regarding Sore Throats and Rheumatic Fever. Please read the Letter from Stephanie Hayes' Parents about Stephanie's suppressed immunity. All WBS students are going to have the exciting opportunity to sew their own reusable tote bags at school (Mon 5th Sep to Wed 7th Sep) with help from "Cecil", the Sew Love mobile sewing camper. Students are requested to bring a pillowcase and neck tie from home as the materials for the bag. "Don't forgot to check the PFP blog site and sign the pledge to support plastic reduction on the Miramar Peninsula! Back into routines and thinking about our goals. We are loving it. We have been enjoying the time we get to do our own writing and express thoughts in this way. There have been some lovely pieces this week. Take a look. It was fun to plant these today. What a great day to do it on the first day of Spring. Sabawoon Education Academy, Pakistan have received our Peace Poems. They are going to make a copy of the presentation for their library and the children will receive their own copies of the poems. They are currently working on some poems and drawings for us. We are looking forward to receiving those. We have begun our new Inquiry around change. We will turn our focus to kitchen science. This week we made jelly and fruit and wrote some instructions. Watch our video to see the experiment and what happened! As we have been thinking about food, we thought we’d find out what people’s Favourite Foods are. Sunnyhills School in Auckland have also added theirs… Feel free to add yours too. We are still buzzing and super proud of our efforts. Read some of our writing about the performance. Here are some more awesome recounts about the music festival. Thank you Wendy for coming in to teach us about waste. We have added to a Waste Education Padlet to share what we have learnt. Please have a read to find out the process we’ve been through over the last few weeks that culminated in our performance last week. Waste… there’s a lot of it! Wendy from Waste Management came in to talk to us about how Wellington deals with waste and recycling. Have a look at the blog to see what we learned, and what we shared with her. We’ve been looking at the nature of water in solid, liquid and gas states. We made ourselves into water molecules and explored the different states. You may have noticed some delightful new plantings at the Awa road entrance to the school. Read about it on the blog. No, this is not a lizard but a lizard gardener! We have begun investigating the extraordinary everyday ingredients which we use in the kitchen for their scientific properties. Good cooks and bakers need to understand the nature of the products which they use in order to control the outcome of their cooking. Read all about it on the blog. How is the sugar changing? Yeast, Baking Soda, Baking Powder! What is making the balloons blow up? Fair Volunteer Form - please complete the Fair Volunteer Form today. We'd love to know what you can help with for the Fair, on the day and leading up to it. Other Donations required now - Sugar, full bottles for the Tombola Stall, clean label-free jars, paper bags, succulent clippings, cardboard boxes and clothing racks, wrapping paper (any style) and old party favours or butcher's paper. Mahutonga/Matariki Only - Andy Griffiths at Seatoun School - Thursday 15 September. No charge, but permission is needed via Wrap It Up, please. Please diary the following Fair Committee Meeting dates: Wednesdays 21 Sept, 19 October and 2 November. All payments via Wrap It Up please. On Tuesday 6 September from 1pm, there is a NZEI Union Meeting. We will be keeping the school open with limited staff. If you are able, please collect your child at 1pm. If you are NOT able to collect your child at 1pm on Tuesday 6 September, please email your child's base group teacher by 3pm on Monday. Please note that the Sausage Sizzle will go ahead. We will serve the sausages slightly earlier than usual. Symptoms appear after 2–3 weeks (usually 14–16 days). Infectious from 5 days (most infectious in the last two days) before the first lot of blisters until all spots are crusted – usually 5 days after they appear. Keep child home for at least 5 days and until all the spots are crusted over. Please check your child/ren for itchy tummy / spots as this seems to be the first symptom. Uncrusted spots are contagious for 48 hours. Please notify the office immediately regarding cases of chickenpox within your family. Thank you to those who have registered their interest for the various sports in Term 4. Once the teams are registered with the appropriate association, you can expect to receive an email from your child's coach/manager. Your donations are at the heart of the success of our Fair. Why not start spring cleaning this weekend and get ready to donate from Wednesday 7 September. We're looking for clothing, baby gear, toys/games/puzzles, books. Dig out those special retro or boutique items that we can sell for good prices. If you wouldn't buy it, please don't bring it! Please do not bring White Elephant/household items or anything broken or missing parts. Location: The Shed. This is the cream shed located in the concrete court area behind the Junior Block. Portable clothing racks required on loan for the Clothing Stall. Donations for White Elephant stall goodies will be taken only on the weekend of the Fair. White Elephant donations include crockery, sports gear, household appliances and and other bric-a-brac. Watch this space….. tickets will be issued to your child shortly. Great prizes up for grabs for the first three balls across the line. A big thanks to the generosity shown by Worser Bay School families, local and national business, supporting Worser Bay School by donating items for the Silent Auction and Rapid Raffle. Click on the Facebook link and you will see who has donated so far. So show your support and support these businesses too. Please also like the page and share with your friends and family. We are still keen on a few more items for the Silent Auction and Rapid Raffle, so if you have a skill, a builder, plumber, electrician, architect, accountant and are keen to donate your services, we would love to hear from you. We are also keen on vouchers for anything, wine and accommodation. So please contact either Stephanie Wilson on asewilson@clear.net.nz or Claire Allen on claireandmattallen@gmail.com. Like and share the posts about our awesome sponsors. Maybe even pop over to their pages? For those who haven’t had a chance, please click on Fair Volunteer Form link to add your name to some of the tasks. We are a small parental community and to make the day a success and, more importantly, FUN for our children, we need LOTS of help and we rely on you! Thanks to everyone who’s stuck their hand up already, but we need this completed ASAP. Please complete it today. Food Stall leads still need filling and we need approximately 5 volunteers per stall and many more for set up/pack down. If you are able to help in both capacities (i.e. being on a stall on the day, and helping with either set-up or pack down) just pop your name down in both boxes - we LOVE that! Celebrating another hugely successful fair. Get in quick to get the job you want. If you are struggling to complete the form online, email Carolyn at cbrett@worserbay.school.nz and she will pop your name next to the stall you wish to work on. The Plant Stall relies on your donations of plants and garden supplies. So, if you have green fingers, you are keen to help out, or you know someone in the community who does, now is the time to start thinking about growing. Pot up: native seedlings from your garden or divide plants that can be split & potted up (especially popular: cabbage trees, flax, grasses, astelia and renga renga lily). Grow: cuttings, veggie plants, herbs. Get Creative: if you have any creative ideas for garden décor please contact us before you go into production. Donations – please bring your plants to school before Fair day, 10, 11 and 12 November. Garden centre vouchers would be handy in the next few weeks so we can purchase seeds and potting mix. Other garden items are welcome anytime. In October we will need lots of potting mix so please get in touch if you have any to spare. Cuttings and potted seedlings – pot up now so they are a reasonable size by 13 November. Remember to water and keep those delicate seedlings in a sheltered spot so they don’t get battered by the famous spring winds. Herbs – take cuttings or split existing plants, eg. rosemary, sage, oregano/marjoram, thyme, mint. Grow from seed, eg. basil, nasturtiums, marigolds. You could try planting up (in a nice big pot) a mixture of herbs, eg. parsley, thyme, lemon balm, nasturtium, calendula, garlic chives. If you would like to help, need potting mix or pots, please contact us as we would love to hear from you. Thanks from the Garden Team - Melanie 021 064 8731. Please drop your donations up to school and pop it into the box outside the office. Alcoholic beverages straight to the office team for safe-keeping…!!! A WBS family of three, with no pets, is currently looking for a house to rent in the Seatoun Heights / Seatoun area. Ideally, it would have 3 bedrooms, 2 bathrooms, garage, backyard or garden. If any adults lost a black glove with a brown pattern on the back at the Music Festival, please come and pick it up from the WBS office. I would like to thank the children at Worser Bay School for such an enthusiastic welcome and such thoughtful questions when I came along to play and talk about the bagpipes for their Music Festival! As an experienced bagpipe teacher who began playing at around their age and has had a lifetime of enjoyment from the instrument, I thought I would mention that I have a few spaces available for tuition at my home in Rongotai. Lessons are for one hour, and are $35. A set of bagpipes is not necessary for the first 6 to 12 months, during which the pupil gets their technique established on a comparatively affordable instrument known as a practice chanter. Do you have musician children? Do they get bored during the school holidays and do they drive you (slightly) nuts? The Rock Academy holiday programme could be what you are looking for. We will be running a 3 day holiday programme in both weeks of the school holidays. This is perfect for any budding musician, give them to us and we’ll send them back to you full of inspiration, musical ideas and confidence. Time: Starts at 9:00am and finishes at 3:00pm. Drop off at 8:45am. Daily busking trips – The pupils get to keep the money, highly motivating and great for their confidence. Group jam sessions – Learning lots of cool new modern rock and pop songs. The Rock Academy’s Got Talent workshop and competition – Pupils learn how to audition, introduce themselves, hold eye contact and perform a piece to take out TRA trophy. Singing lessons/exercises – Singing exercises and scales every morning. Instrument skills sessions – learning new riffs, licks, chords, tricks and techniques. Industry workshop – Learning how to be a successful musician however ambitious they may be. Solo and group song writing sessions – Pupils are asked to write and performn their own songs over the three days. We do book out in advance, so please contact us well before the holidays if you are interested. Laura Langman is coming to Netball Wellington to run NETFIT Classes on 27 September 2016 at ASB Sport Centre. This is a high-energy 45 minute netball gym class which combines explosive movement with strength and power exercises to music. The classes are all based on netball specific fitness, teamwork and empowerment. All of this for just $25. Numbers are limited, so you have to be in quick. To register, go to: reg.sportingpulse.com/regoform.cgi?formID=61932. 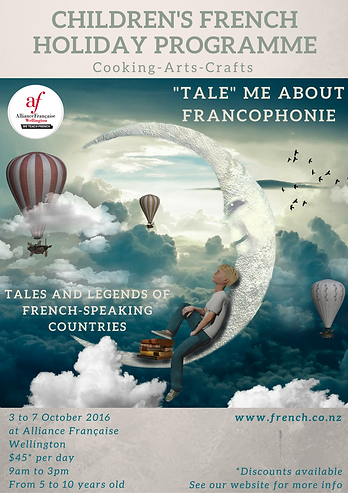 3 October - 7 October | 5 Days - "Tale" me about Francophonie - Places are selling fast! Fencing classes during school term in ASB Sports Centre on Mondays. For further information and to book a place, contact PING YUAN at nz_wfc@outlook.com or on 021 059 2558. Village Hall, 22 Forres Street, Seatoun. MYTH BUSTERS - for 11 & 12 year olds...perfect if you like experimenting and discovering crazy stuff! ART & CREATIONS - a fun chance to unleash your artistic and crafty talents. PERFORMING ARTS - a great stream to express yourself creatively through dance & drama. HORSE CARE & RIDING - learn the basic skills required to care for and ride a horse. SPORTS & OUTDOOR ACTIVITIES - all the usual great activities, which could include water slide, archery, rifles, tubing, rock wall and more. If you are a parent, staff member or member of the school community and draw down a new ASB home loan of $150,000 or more, ASB will donate to your chosen participating school $500. Visit www.asb.co.nz/schoolbanking for more information.